Sooner or later, your L&D department will receive a request to create a training solution that you know is not necessary. You know it won’t address the root cause of the performance problem, and you would be adding an unnecessary training item to your catalog. 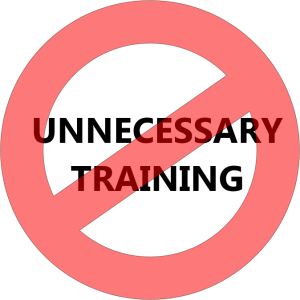 So how do you say “no” to unnecessary training in a way that doesn’t hurt your relationship with the business? Can you say “no” and at the same time initiate a productive conversation that points to the source of the problem? There are many approaches to achieve that, but in this post I am going to share a small downloadable template that has worked quite well for me in some contexts. Borrowing a page from Human Performance Technology principles, it explores in a systematic way the factors that may be affecting performance. But wait… Human Performance Technology… that sounds like a long consulting process, right? Well, no. I learned my lesson and know that many teams are too fast and nimble for a more conventional consulting process. I have always completed this template with the business leader that requested the new training in about 30 minutes, and in most cases it was an eye opener for them, both in terms of offering a solid, well justified “No” and in pointing to the right areas to tackle performance. There is just one rule for filling out the template: all the data must be provided by the business owners. Your role is to facilitate and clarify the use of the template, not to contribute data. In practice, I always keep control of the file by projecting it on a large screen and typing all the information. Business leaders can then focus on reflecting so they provide an accurate account of the system they are trying to improve. The template guides you through a review of environmental and individual factors that affect performance. The goal is to mentally review each of the areas and assign a score. It doesn’t have to be very accurate. In fact, if you have more than one business owner at the table, expect some disagreement. In those cases, do not try to drive consensus; instead, simply enter the average. Remember, you are trying to complete this in around 30 minutes so you can use the remaining 30 to discuss what (if not training) can be done to address the problem. You will find three questions under each of these areas. Feel free to customize them according to your context. They should represent a substantial portion of one of the six high-level areas above and be potential causes of poor performance in your context. Briefly explain that you are asking your business owner contact to provide their perception on each of these areas and questions in a 9-point scale. When answering each question, they should keep in mind the problem or opportunity that they believe justifies new training. Don’t let them dwell on any question for too long. Average out, compromise, put a dot on the scale and move on. By the end of the exercise, you will have scores calculated for the 6 areas, and those requiring more attention highlighted in red and orange. Is Knowledge/Skills one of them? If not, training is most likely not part of the solution, and you have one or more areas highlighted in red. Use the remaining 30 minutes to talk about them. And yes, perhaps training is part of the solution. If so, make sure you develop a learning solution that ties in with everything else, particularly what also appeared in red or orange. Finally, this is not a template I would use on every occasion. But when I am going to meet number-driven, time-poor business owners who are looking for a quick performance analysis and are genuinely open to suggestions to tackle a known, well-defined problem, this approach has worked well for me. The template has been pre-populated with a fictitious example where I have been asked to provide training to employees who are not completing incident reports on time, and the reports are not descriptive enough to address the incident. The business owner wants me to develop application training so employees use the report filing software efficiently, and also a writing skills workshop. Thanks to this template, we conclude that the team will need to be more explicit about why filing correct reports on time is important to the business, and will need to tweak the incentives that support this activity. No new training is developed. Practical use notes: This is an Excel 2013 file that uses conditional formatting. I use a bullet to place my score, but any symbol or letter will do; just make sure all other cells are empty so they are not computed. Also, if you modify the template by adding more questions, keep in mind that the formulas may require some editing.